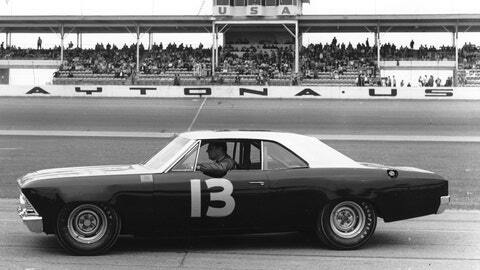 After taking the pole in the 1967 Daytona 500, Curtis Turner's luck would run out ... he'd finish 25th. Racers are a superstitious lot. In NASCAR, three of the most prevalent superstitions are no green race cars, don’t eat peanuts in the pits or the garage, and donât carry $50 or $100 bills. But on this Friday the 13th of December, what about the No. 13 in the NASCAR Sprint Cup Series? Truth is, the No. 13 has had almost no luck at all. Seventy-one different drivers have made a total of 375 Sprint Cup starts in the No. 13, but just one car carrying the No. 13 has ever won a NASCAR Sprint Cup race, and that was more than half a century ago. It happened at Daytona International Speedway in Feb. 1963, when Johnny Rutherford won one of the two 100-mile Daytona 500 qualifying races in the iconic black-and-gold Smokey Yunick-owned No. 13 1963 Chevrolet Impala. Four years later at Daytona, another Yunick No. 13 Chevy turned up at Daytona and turned the stock-car world completely on its ear. By 1967, Chevrolet had long since pulled entirely out of the sport, but Yunick entered an unsponsored Chevy Chevelle in the Daytona 500. It was driven by the legendary Curtis Turner, who promptly put the car on the pole. "This was at the absolute height of the Ford-Chrysler factory wars, also (a tire war) between Firestone and Goodyear," said former Charlotte Motor Speedway President H.A. ‘Humpy’ Wheeler. "Smokey shows up with a ’67 Chevrolet Chevelle with Curtis Turner driving. It was two renegades coming into Daytona, neither could care less about what anybody thought of them. All of a sudden, the first time I saw the car, I thought the car was awful small. The Chevelle, an intermediate-sized production car, was smaller than the full-size Ford Galaxie and the Dodges and Plymouths that were running. But Smokey’s car didn’t look like it was as big as the Chevelles I’d seen. "In practice it didn’t really do much. Here comes pole day, and he wins the pole. This would be like a Peugeot coming in and winning the pole today in a stock-car race. It was such a shock. It was so embarrassing to the factory teams. I have never seen longer faces in my life at a racetrack, other than when somebody’s killed, than at Daytona that day. NASCAR scrambled all around trying to find out who did what to whom, how did that damn thing get on the pole?" The answer was simple: It was about 7/8ths the size of a production car. "What did Smokey do with the car? He just made a small Chevelle out of it and took advantage of something nobody paid much attention to in those days, and that was aerodynamics," said Wheeler. "It was less to move through the air. He had the fabulous ability to get more horsepower out of an engine than anybody else on Earth could. So the combination was earth shattering. It would be interesting to get that car and find out what size it really was." Alas, Turner retired with engine failure after 143 laps, finishing the Daytona 500 25th.